Preheat the oven on 180°C. Cut the 4 O Mundo Hot Dog Buns lengthways and put them in the oven for 5 min. Heat the sauerkraut and the red cabbage according instructions. Take the O Mundo Hot Dog Buns out of the oven and spread horseradish on both sides. Add the sauerkraut on one side and the red cabbage on the other. Put a heated Hot Dog in the middle and enjoy! 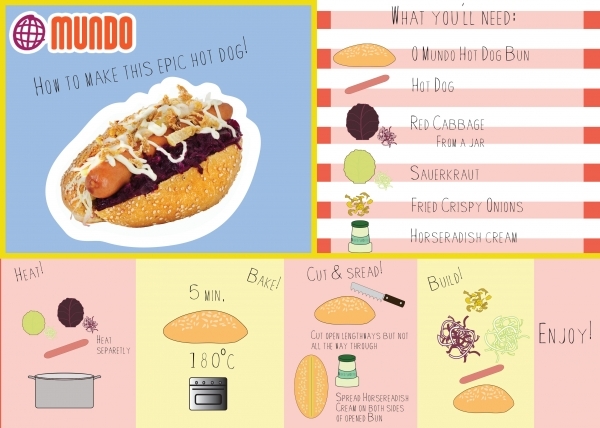 Preheat the oven on 200°C and place the 4 O Mundo Hot Dog Buns in the middle of the oven for 5 minutes. Cut 2 onions in half rings and cut 1 clove of garlic. Fry the onion for 2 minutes in a frying pan with a bit of olive oil. Add 1 tbsp. of tomato mash and add the garlic. Cook for 1 minute. Add 1 tbsp. of sugar and 50 ml. of red vinegar and 50 ml. of water. Evaporate everything for about 4 minutes. Add some salt and pepper. 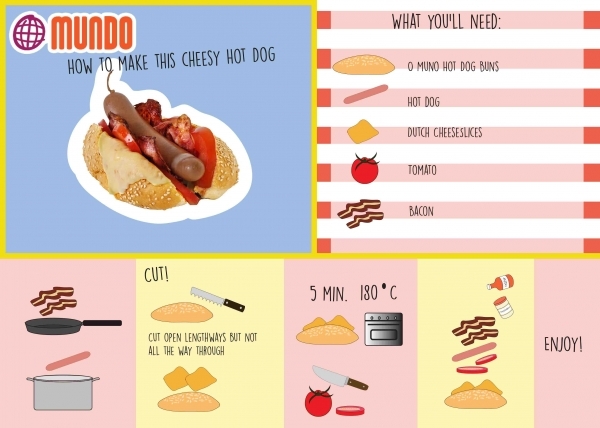 Cut the O Mundo Hot Dogs buns lengthways and add the tomato sauce. 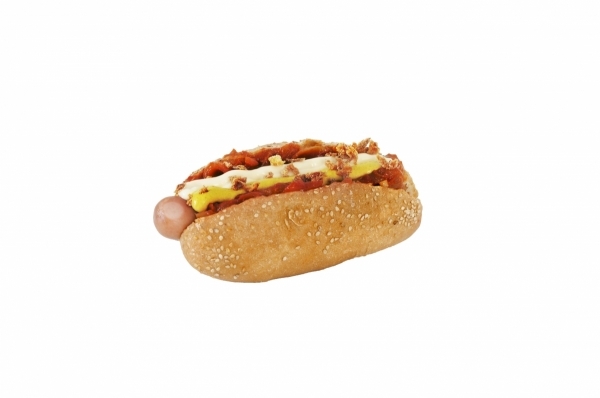 Place a heated hot dog inside the bun and add mayonnaise, mustard and fried onions. Tip: you can also add some heated sauerkraut.